The programming language for Office. Microsoft Office is an amazingly powerful suite of programs that often inspires people to use it for all sorts of things for their business. Excel is probably the one that does this more than the others. The company had been making extensive use of spreadsheets for a few years but were now moving to using a database. They wanted to migrate the data from Excel into the new system. Unfortunately simple copy and paste wouldn't do it! They also had lots of spreadsheets and needed to transfer the data over a "go live" weekend. We built an application in Access that allowed them to choose one of their spreadsheets, click a button and it all appeared in their database! We had to build in lots of checks to ensure the data in the spreadsheet was vaild, convert columns in Excel to rows in the database and do calculations, the results of which were written to the new tables. A spreadsheet pulls in data from an internal CRM system, validates it against a web service and suggests a correction. The user then accepts or makes a change then updates the CRM. 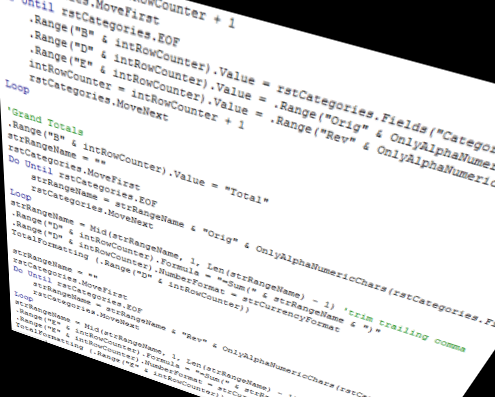 You may want some code written to automate Excel. Call us to discuss what an Excel developer can do for you. Fairly quickly when developing Access applications, you find that a sprinkling of some code would do wonders to your system. Macros can't do everything! Talk to us about what an Access developer can bring to your database. Whilst the VBA code can live in just one application, we frequently "drive" Word from a different one. An example is to create Word documents to print and send from data in Access. The button in Access starts Word and creates a document. The benefit using Word is the power available to format the document. One of our manufacturing clients now has a system that produces paper forms that machine operators take with them. Another used our Word development skills to have acknowledgments generated for payments received and contracts created for the property their clients buy. Here's another example that a Word developer can create. PS. By the way... it stands for Visual Basic for Applications!